OMS by Jagged Peak is now an Elastic Path Extended Commerce solution, making it easier to manage and fulfill orders in even the most complex retail environment. Jagged Peak is a leading provider of software and services that enhance the scalability, flexibility and profitability of omnichannel businesses. Its robust Order Management System (OMS) can be deployed alone or coupled with a Warehouse Management System (WMS) and Transportation Management System (TMS) to form a shop-to-ship, web-based software suite that integrates the entire order life cycle with visibility across business units, distribution channels and trading partners—all while enabling the client to have complete control of their online brand. Jagged Peak's blue chip client roster includes numerous global consumer brand companies. OMS by Jagged Peak is a SaaS order management system that aggregates and manages the lifecycle of any order type from any source. 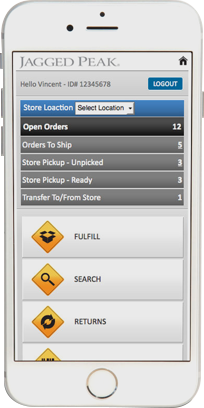 It automatically creates “perfect orders,” simultaneously assessing inventory availability, customer proximity and delivery time to provide optimal fulfillment and meet the customer promise date. This allows brands to reduce shipping costs and enhance overall customer satisfaction through improved order delivery performance. OMS by Jagged Peak monitors inventory in real time, regardless of whether it resides at a distribution center, store, manufacturer, product supplier, or drop shipper. And because OMS by Jagged Peak “sees” all available inventory, it can source orders to the optimal fulfillment point, streamlining the order execution process, optimizing inventory, and reducing shipping costs. Managed through built-in modules, OMS by Jagged Peak gives your business users real-time administrative control over processes, providing a complete, intuitive and functionally robust solution delivered via a SaaS model. OMS by Jagged Peak enables new and personalized fulfillment models in order to meet the expectations of today’s omnichannel consumer. Capture and management of orders from any channel, source or format, enabling true omni-channel experiences that drive more business. Apply business rules for frictionless order processing to improve order accuracy resulting in enhanced customer satisfaction and improved profitability. Lower your shipping costs by automatically routing orders to the warehouse, store or dropship provider closest to the customer. Maximize customer satisfaction with true “buy anywhere, fulfill anywhere, return anywhere” omnichannel shopping options. Apply business rules (proximity, inventory availability, etc.) to determine best fulfillment provider (store, DC, drop shipper etc.). Real-time inventory visibility across all stocking points enables real-time ATP for optimal order sourcing (including customer instructed). Enables store level fulfillment without use of POS system; eliminates need to replace legacy POS system if fulfillment tools are not offered. As a SaaS product, OMS by Jagged Peak can be deployed anywhere there is Internet service, reducing risk and lowering costs. Contact us to see how a distributed OMS can make it easier to capture, manage and fulfill orders in today's omnichannel retail environments. Vancouver (October 28, 2014) – Elastic Path Software, an ecommerce company helping the world’s biggest brands generate more revenue, announced a strategic partnership with Jagged Peak that will help brands save time and money by streamlining traditionally complex order and fulfillment processes. Jagged Peak’s Order Management System (OMS) software is now part of Elastic Path’s Extended Commerce Solution, making it easier to capture, manage and fulfill orders in today's omnichannel retail environments. Jagged Peak’s software is a distributed OMS that aggregates and manages the lifecycle of any order type from any source. The software automatically creates “perfect orders,” which means simultaneously assessing inventory availability, customer proximity and delivery time to provide optimal fulfillment and meet the customer promise date. This allows brands to reduce shipping costs and enhance overall customer satisfaction through improved order delivery performance. Elastic Path offers a complete suite of enterprise-class commerce solutions encompassing all customers’ needs. In addition to Jagged Peak, Elastic Path has signed multiple partnerships since September, including Agility Multichannel for product information management (PIM) and MRM//McCANN for managed hosting services. Jagged Peak is a leading provider of software and services that enhance the scalability, flexibility and profitability of omnichannel businesses. Its robust Order Management System (OMS) can be deployed alone or coupled with a Warehouse Management System (WMS) and Transportation Management System (TMS) to form a shop-to-ship, web-based software suite that integrates the entire order life cycle with visibility across business units, distribution channels and trading partners—all while enabling the client to have complete control of their online brand. EDGE is deployed through a license or cloud-based SaaS delivery model. Combining its technology with a comprehensive array of eMarketing, customer support and IT professional services along with "anytime, anywhere" order fulfillment through its FlexNet warehouse network, Jagged Peak offers a rare and uniquely holistic approach to eCommerce. Jagged Peak's blue chip client roster includes numerous global consumer brand companies. For more information, please visit www.jaggedpeak.com.